When Stephen recently visited Vandenberg Air Force Base on a business trip, the girls and I grasped the opportunity to escape Los Angeles for a few days. We used the base's temporary living facility for lodging and explored several sites in the area. Of course, we knew we needed to visit Solvang as Christmas was just a few weeks away, and this town contains many unique shops. With only the morning to explore, we accepted the fact that we needed to confine our wanderings to a small area. We parked on Alisal Road and strolled around that road and a couple of blocks of Copenhagen Drive. Of course, all this shopping requires energy. Dining options abound, but we limited our consumption to a couple of snacks as we expected to eat a large dinner that evening. Our first treat came from the Solvang Bakery, where Holly and I shared a cream cheese Danish and Taylor selected a gingerbread man. We also ordered from their varied selection of hot drinks. When we finished our shopping, we visited the Solvang Restaurant to share some aebleskivers and Danish sausage. We finished the sausage at the restaurant, but we took a few of the pastries back to our lodging. They warmed nicely in the microwave when we wanted a quick snack later in our trip. Upon returning to our vehicle, we discovered the nice shopkeeper at H and P Vinhus had left a surprise for the girls: two Advent calendars that included a treat for each day leading up to Christmas. With our shopping completed, we decided to drive to the Elverhoj Museum of History and Art. 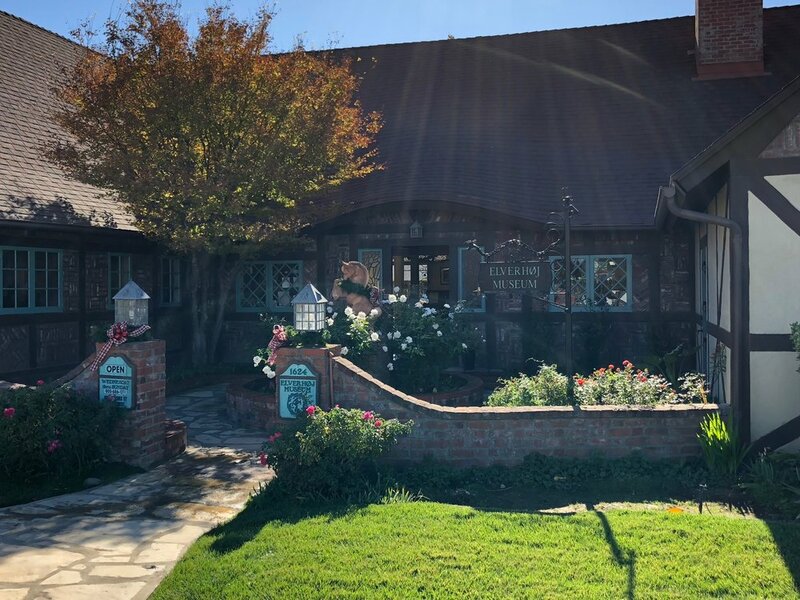 The museum features several permanent exhibits about Solvang's history, including a fantastic diorama of the town from the past. The art gallery contains rotating exhibits. When we visited, it displayed Christmas card art by Eyvind Earle. The girls and I thought his style seemed familiar...then we discovered he painted the diorama backgrounds in Disneyland's Sleeping Beauty Castle....so no wonder!! We've seen those a few dozen times. To our surprise and delight...we received a reminder of an excellent book we read in the course of our studies, "The Wheel on the School." Set in Denmark, of course, the book tells the adventures of a group of children who seek to bring good luck to their town by luring some storks to build a nest on the school roof. Our trip came full "circle" as we started with fairy tales and ended with one of our favorite school stories.